The Messerschmitt Bf 110 was designed to be the German long distance fighter, but something happened between the concept and the execution. The Zerstrorer concept was flawed from the beginning however the Bf 110 was a successful design in another role as night fighter. 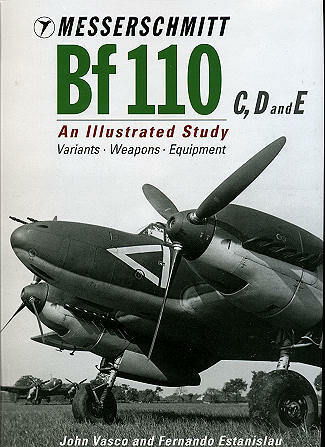 This 192 page hard cover book starts with the Bf 110 B and follows the evolution of this fighter through the E series. Every change is documented in some of the best drawings I have ever come across of the early Bf 110 variants. John Vasco is well known as an acknowledged Bf 110 expert. This book is his culmination of work on the early Bf 110 . The photos contained in this book are absolutely marvelous. Most of the photos are black and white and most are previously unpublished. The color photos are impressive as well. All the photos are large and crystal clear, absolutely perfect for the modeler. There is nothing left to the imagination here. There are a lot of photos from the servicing manual, mechanics and pilot’s handbook. These wartime illustrations and photos contribute an added dimension to the book. One series of color photos is taken from a 16mm film taken by the Vultee Aircraft Corporation of a captured 110. So how does it read? Well it reads well but if you are looking for a dissertation on the Bf 110 this is not it. The value comes with the captions for each photo. That is where the real information is. I don’t say this in a negative light at all, quite the opposite. I think this allows more information to be contained and explained. This book is about the evolution of the Bf 110 not the infighting within the Luftwaffe. If you want to know about the early variants of the Messerschmitt Bf 110 then this is THE ONLY book you will need. The Fernando Estanislau drawings are first rate and exceptionally well done. Every nuance of the airplane is covered. There are no full color profiles of operational machines, instead he decided to focus on the airframe. The profiles are all done in a RLM 76 base color so the differences are the focus of the profiles and not which color is correct here or there. As an example, the much talked about wheel size is illustrated quite clearly as is everything else from the glass cockpit to the internal parts of the airframe. There is a chapter on camouflage that does show the evolution of camouflage schemes which will be essential to any modeler. The photos tell the real story of the camouflage and its applications as the aircraft developed. There are a lot of interesting schemes to the Bf 110 . The camouflage drawings cover the basic schemes but the photos show how these could be overpainted and changed to suit the operational environment. If you want to build the Eduard series of Bf 110 s or the new Dragon 1/32nd scale offering, this book is essential. Let me say it again, this is THE book on the early Bf 110 s. I personally hope there is another book in the future on the F and G series. I can’t say enough good things about this book. It is a great resource. Sure it would have been nice to have some color profiles but the book does not suffer from them not having them. There are plenty of photos to motivate the modeler and information for the aviation historian. Thanks to Aeroplane Books for the review copy. You can obtain your copy from them at www.aeroplanebooks.com or by calling them at 1-800-673-1307. Make sure you tell them you heard about it here.